In my mind, public archaeology involves reaching out and interacting with different audiences, ranging from those with little knowledge of what archaeology actually is (no, I don’t dig up dinosaurs—yes, I think dinosaurs are cool) to individuals whose passion and skills for archaeology rival or exceed my own. Until recently, my interaction with the public has largely been face to face, via public lectures, working with volunteers in the field and laboratory, and conducting hands-on workshops. Public lectures are a great way to reach an interested audience—and students who want extra-credit—but I find that the level of interactivity is usually not very high. Sure, people can ask questions, or come up and speak directly with me afterwards, but they may still be formulating their thoughts on what I just presented to them—or thinking about the long ride home in heavy traffic. Field and laboratory volunteers—especially those who return regularly and for extended periods of time—can get that thrill of discovery and also know that they are contributing meaningfully to interpreting an historic site. Hands-on workshops are much more regulated affairs—but can provide members of the public with an insight into how we approach analysis of the past, and, perhaps, give them something tangible to take home and further reflect on what archaeology can tell them about the past. Not everyone has the time or means to journey to our public events or venues, and the question must be asked: how do we reach these individuals? Many of us maintain our own project blogs or websites, Facebook pages, or Twitter accounts—and these certainly are a useful way of reaching out to a wider public. Some web sites are sophisticated virtual extensions of established museums, exist as museums with no physical brick-and-mortar component, or represent places that no longer exist in the real world. Even with these virtual media, the level of meaningful interactivity between the user and the site can vary. VCU students scanning an historic artifact at Thomas Jefferson’s Poplar Forest. Courtesy of the Virtual Curation Laboratory. For over a year now, I’ve been working with undergraduate students at Virginia Commonwealth University (VCU) in our Virtual Curation Laboratory (details can be found at: http://vcuarchaeology3d.wordpress.com/). We’ve been using a NextEngine Desktop 3D scanner to create digital models of historic artifacts from a wide variety of heritage locations in Virginia and Pennsylvania, and, in some cases, using the digital models to generate plastic replicas using a MakerBot Replicator. The Virtual Curation Laboratory was initially funded by the Department of Defense’s Legacy Program (Legacy Project #11-334) to test how well the NextEngine Desktop 3D scanner could be used to virtually curate fragile artifacts, “preserve” them digitally, and make them more widely available to researchers to ease determinations of National Register of Historic Places (NHRP) for sites on military lands. A secondary goal was to help raise awareness of military personnel and their civilian neighbors about significant cultural resources under the care and protection of the Department of Defense. Digital model of a tin toy soldier from Thomas Jefferson’s Poplar Forest. Created by the Virtual Curation Laboratory and used with permission of Thomas Jefferson’s Poplar Forest. Because the NextEngine scanner is portable, and because we wanted to scan a wide variety of historic artifacts, my students and I travelled to a wide variety of heritage locations and collections repositories to create scans of both common and unique objects—mostly “small finds” that help tell the story of the nation’s historic past. VCU students have created 3D digital artifact models of historic objects from archaeological collections at George Washington’s Ferry Farm, Mount Vernon, Jamestown Rediscovery, Colonial Williamsburg, Montpelier, Poplar Forest, The State Museum of Pennsylvania, among other locations. Digital model of a tea pot lid finial in the shape of a satyr’s head from James Madison’s Montpelier. Created by the Virtual Curation Laboratory and used with permission of James Madison’s Montpelier. Many of these items are rare and the general public would have little opportunity to touch the actual object, or even see it in some cases due to limited exhibit space. The process of creating a digital model, particularly the NextEngine’s lasers playing across an object in a darkened room as it scans an object, certainly grabs the attention of even casual visitors to an historic site. Illustration of visitors to George Washington’s Ferry Farm watching scanning of historic artifacts in progress. Illustration by Jamie Pham and courtesy of the Virtual Curation Laboratory. Virtual curation—the creation of intangible digital models from tangible artifacts—has clear benefits to opening up America’s historic past in ways never before possible. We can combine virtual curation with social media as part of a dedicated strategy to promote and build a truly participatory culture that changes how we experience and think about heritage. Public and scholarly interaction with digital artifact models can certainly foster a more reflexive archaeology. Diverse observers can move virtual objects or travel through virtual worlds, creating a dialectical relationship between past and present–and expand interpretation and reflection beyond a narrow group of scholars. Resulting images from 3D scans can be processed and sent out to scholars, researchers, or the lay public as they are generated, opening up windows for countless interpretations and reinterpretations of artifacts by people who might otherwise never have access to these unique small finds. Virtual models, especially of fragile artifacts, create a closer connection between ourselves and events, or even individuals, from the past. Colonoware vessel from George Washington’s Mount Vernon Estates and Gardens. Created by the Virtual Curation Laboratory and used with permission of George Washington’s Mount Vernon Estates and Gardens. 3D technology creates an “active” role for the consumer of archaeological depictions in a way that is not possible if we rely on more traditional, static graphical techniques, such as pen-and-ink illustrations or black-and-white or color photographs. Viewing an object in motion gives us a greater sense of the purpose for which it was created. Archaeological materials are best understood when they can be revisited time and time again, and subjected to new theoretical insights and radically different perspectives by all of us interested and invested in the historic past. A recent presentation by a student really brought home to me the power of these 3D digital artifact models for creating meaningful interaction between the student and a member of the audience. VCU student Rachael Hulvey was showing a model of a Susquehannock effigy pipe that was identified by the discoverer as representing a bear. We in the Virtual Curation Laboratory all agreed that the animal was clearly not a bear, given its long tail. In the static photograph published this pipe, the elongated tail is not visible. However, the animated digital model showed the tail and all other salient features, and a member of the audience was able to identify the animal as representing a fisher (Martes pennant)—a member of the weasel family with a penchant for eating porcupines. Plastic replica (left) of an 18th century bone brush (right) recovered at George Washington’s Ferry Farm that is incorporated into their “touch box” for visitors requiring a more tactile than visual experience. Courtesy of the Virtual Curation Laboratory. Physical plastic replicas can also be produced from the digital models as needed for educational and study purposes. Educational institutions or researchers could readily access these digital models from secure internet sites, and print copies on their own 3D printers. In our outreach efforts here at the Virtual Curation Laboratory, we find that the general public and non-archaeology students prefer the plastic models to digital models that they can manipulated on a computer screen. These plastic models can be reintroduced into field contexts. At George Washington’s Ferry Farm, plastic replicas produced from scanned objects can be safely incorporated into public lessons for people of all ages, while the actual objects are safely and securely stored within a laboratory context. The plastic replicas have also been incorporated into a “touch box” at George Washington’s Ferry Farm for visitors who have impaired vision. VCU student Ashley McCuistion holds plastic replicas of scanned artifacts used at public programs in the field at George Washington’s Ferry Farm. Courtesy of the Virtual Curation Laboratory. With the increased use of and accessibility to 3D images and data, one question can be posed: how might historical archaeology be transformed when archaeologists and members of the general have equal access to studying intangible virtual models instead of tangible artifacts? 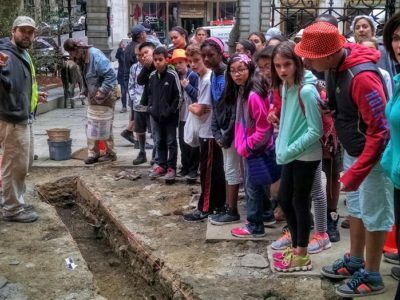 Public Archaeology Happenings in Seattle: What not to miss! Getting the public more aware of how material culture informs us about the past is really valuable. Mount Vernon has a lower tech version of the 3D images (http://www.mountvernonmidden.org/data/objects2.html?rID=2568) using animated gif’s, but the detail and tactile dimension of printing these things is a fascinating addition. I think the importance of these 3D images in drawing the public into looking at objects is great, but for archaeology it’s really important to present the materials in a context-rich environment both spatially and thematically, lest the object is prioritized over the assemblage. With an existing backlog of materials to catalog archaeologists can’t create 3d images of all artifacts, but making materials available is surely a crucial part of archaeological advocacy. This is great thing to bring awareness in people,s mind about archeology and material culture. The best thing is that even if they cannot touch the original artifact, they can touch its almost real like duplicate. Nevertheless the copies cannot replace the original ones.